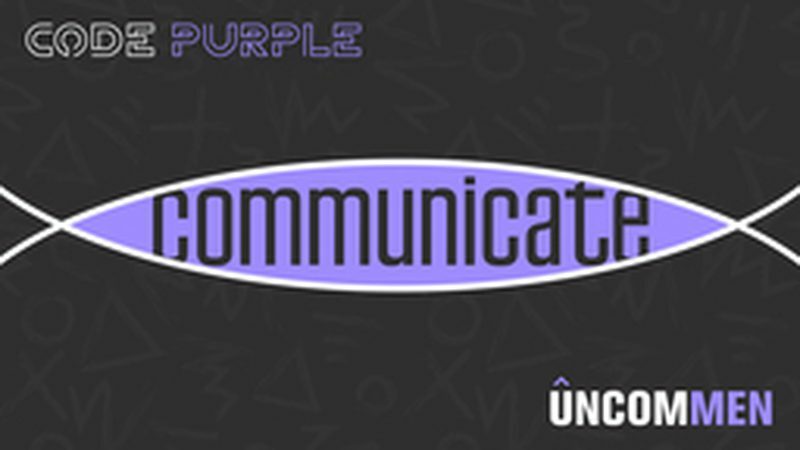 UNCOMMEN: Code Purple - Code Purple? It’s the overlap of blue and pink. It’s where men and women interact with each other in a way that may be different than the way they are used to. The blue man shows up to hear the problem, dole out a fix and get back to the game. The pink woman shows up with emotions to spare and wants you to listen to her, and the issue at hand. Where they overlap is what we call... CODE PURPLE. My wife and I started to refer to this term when we seem to be coming to a topic from entirely different angles. Sometimes that is an excellent thing as it allows the strengths of both to shine. Sometimes it’s an alert to check your motives, and sometimes it’s a “Watch out, Jack!”. Ever get into a conversation with someone, and it’s like you’ve pushed over a bucket of water? Every detail in their life just spills out like the stream of a firehose. There are no pauses, there are no breaks in the conversation. It’s just one-sided, and you’re there to listen to it. When it comes to grievances, this isn't a big deal. People desire to be heard. It becomes more troublesome when people are argumentative, blaming and overly negative. They aren't looking for a discussion. Have you done that before? I know people who say they are Christians who are always angry. It seems they are not just mad at this group or that tax. They're frustrated with everything, and they really want you to know about it. Granted, there are topics to be passionate about, but not everything is worth you fighting over. If social media had just one fatal flaw, it gave a platform to the “Ugly Christian” to spew whatever agenda they wanted to at the click of a button.